There’s a box full of clothes in my closet, labeled “to sew.” Sad but true, I’ve had it for years, and the darn thing is almost full. Each piece has a simple defect like a missing button or a split hem, nothing too major. But for whatever reason, I avoid it like the plague. My new goal is to tackle that box, item by item, starting with the easiest fixes and absolute favorites. I’ll probably need to rethink what’s worth fixing in the first place. Not a fun project, but in the end I’ll have a boxful of clothes to work into my wardrobe, without breaking the piggy bank…all with a needle, some thread, and a few buttons. 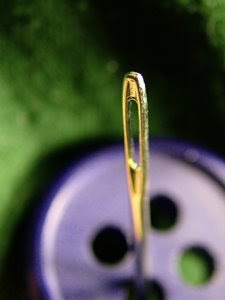 If you still don’t have time or don’t trust yourself with a needle, take your favorite pieces to a professional tailor. They should give you a deal on simple repairs and mending, especially if you bring the whole box! It never hurts to ask. Button replacement can cost as low as $5, I’ve even seen specials for $2. Need a tailor? Ask around. Word of mouth can be the easiest way to find one. To keep it cheap, steer clear of bridal shops, which can be ridiculously overpriced. For a guaranteed deal, go to a dry cleaner or Laundromat that offers alterations. To be sure, look for “economy” or “discount” in the business name! I’ll keep you updated on how the project goes and what I rediscover.